Cutaneous allodynia is an established marker for central sensitization in migraine. There is debate whether cutaneous allodynia may also occur in cluster headache, another episodic headache disorder. Here, we examined the presence and severity of allodynia in a large well-defined nationwide population of people with cluster headache. 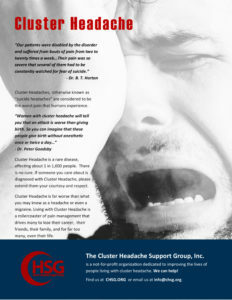 While headache is not an uncommon symptom in patients suffering from pituitary adenomas, cluster headache (CH) has rarely been reported in such cases. Headache associated with hyperprolactinemia has been reported to be responsive to dopamine agonists (DA agonists) in many patients. We report on a patient with refractory CH secondary to a macroprolactinoma who showed immediate and permanent clinical and radiologic recovery following medical treatment with DA agonists. Measurement of prolactin levels in addition to cranial magnetic resonance imaging might be considered in patients with refractory CH, until the significance of this potential causality becomes clearer.